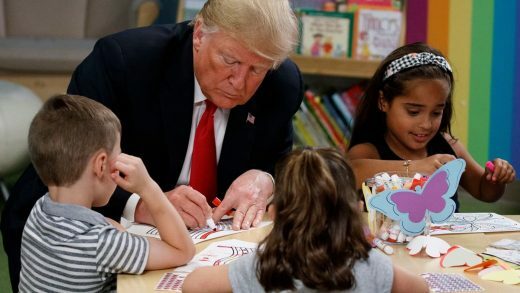 Earlier this month, the president of the United States of America was spotted making some unassuming changes to the flag during a photo-op at a hospital for kids in Columbus, Ohio. Trump used blue and red markers to fill in two of the flag’s stripes, which are, of course, meant to be red and white. Max Temkin, designer and cofounder of Cards Against Humanity, has found a way to honor the president’s creativity–by printing T-shirts featuring his MoMA-worthy reimagination of the American flag. A Twitter user caught the President’s Duchamp moment on August 24. In the next photo, you can see Trump deeply concentrated, trying not to color outside the lines with his blue marker as the children look on, apparently in disbelief.